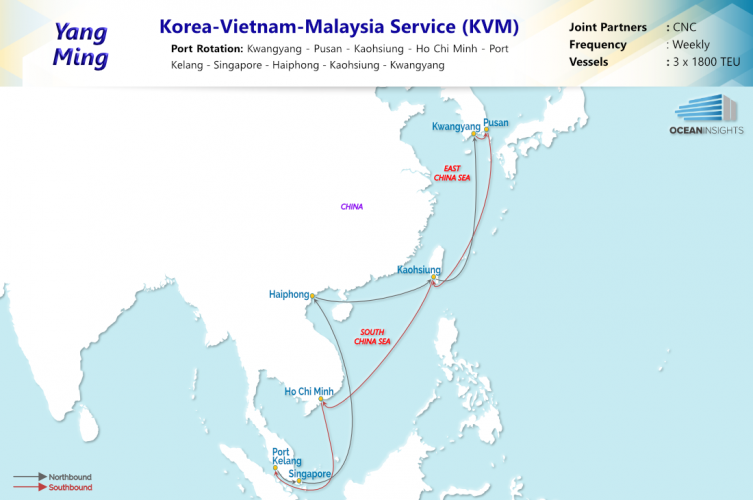 Yang Ming Marine Transport Corp. (YM) has announced a new Intra-Asia service KVM (Korea–Vietnam–Malaysia Service) jointly operated by YM and APL Co. Pte Ltd through its CNC brand with effect from February 21st, 2019. The full port rotation will be Kwangyang – Pusan – Kaohsiung – Ho Chi Minh – Port Kelang – Singapore – Haiphong – Kaohsiung – Kwangyang. A round trip will take 21 days. The new KVM service is expected to connect Northeast Asia and Southeast Asia more efficiently and provide customers with more convenient and excellent delivery service. Further information about the service network is available at Yang Ming website (www.yangming.com). Please contact Yang Ming local offices for more details. Tags: APL, CNC, Intra-Asia, Korea, KVM, Malaysia, Vietnam, Yang Ming Marine Transport Corp.